The months of 100+ heat have finally subsided; it was reaching the point where I could no longer imagine what it felt like to step outside without it feeling like a steam sauna. Literally overnight, the weather dropped almost 40 degrees, reportedly due to a Canadian cold front. Thank you, Canada! It seemed like the perfect day to get back to baking. I’ve been trying to make healthy treats for Nick and Kevin’s lunches (and teatime for me) so the decision to make some cookies was an easy one. Second, I’ve been itching to do more experimenting with the quinoa flour in my pantry (or, more precisely, my freezer; I store my whole grain flours in the deep freeze to preserve their freshness). Hence, quinoa biscotti. I am in love with quinoa flour. It is a gluten free flour, packed with nutrition, and a breeze to work with. It has a nutty, subtly sweet, mildly grassy flavor that is incredibly delicious in cookies, muffins, scones and pancakes. Most gluten-free flours require the addition xanthan gum (or guar gum, or gelatin) to help the finished baked good hold together in the absence of gluten. While it works, I am not crazy about using it after reading more about the side effects of ingesting and being exposed to it. Moreover, I think the presence of xanthan gum in the ingredient lists of gluten-free recipes discourages baking experimentation (both for those who need gluten-free foods and for those curious about exploring wheat-free options). It sounds weird. And it’s a big investment (i.e., about $12 at the grocery store) for the 1-2 teaspoons required in a given recipe. So far, I’ve been able to make a number of wonderful quinoa flour baked goods without any need for gums of any kind. Yet again, quinoa proves to be a superfood in more ways than one. I used one of my favorite biscotti recipes as a template and played around with the proportions. My first batch looked great, but it was a bit drier than I had hoped. I had cut back on the amount of fat I usually use in the biscotti recipe because quinoa flour has a slightly higher fat content than all-purpose flour, but it wasn’t warranted here. Decreasing the flour by 1/4 cup and upping the oil by a tablespoon did the trick. Modesty aside, these biscotti are fantastic. They passed the husband and 5-year-old tests with flying colors and they made my cup of afternoon tea–drunk outside in the sweet, 70 degree outdoors–positively blissful. I love that these are gluten-free and nutritious sans any added complexity. I used cranberries and almonds, mostly because they were what I had on hand, but like any biscotti recipe, you can flavor these darlings with the spices, zests, dried fruits, nuts, seeds, or chocolates of your choosing. I’m on a quinoa flour kick, so look for more sweet and savory posts in the days and weeks ahead. Yes, I’m back to posting on a regular basis. Look for tomorrow’s post–and the next day’s and next day’s–for proof. Thanks for reading, everyone. The biscotti mixture is a little bit crumbly–I simply dump it directly onto my silpat or parchment paper-lined baking sheet and ten squish the moist crumbles (moist hands are a good idea) into two logs. Keep in mind that that the dough did not spread as much as wheat flour biscotti. Cool the log (yes, cool, cool, cool! If you have the time and notion, you can even cool completely if you do not mind turning the oven off and turning back on again later.) The log is exponentially easier to cut the more it cools. Don’t worry if one or two slices crumble–those are property of the chef! Position a rack in the center of the oven. Preheat oven to 300°F. Line a large cookie sheet with parchment paper. In a medium bowl, whisk the quinoa flour, baking powder, and salt until blended; stir in the dried cranberries and almonds. In a large bowl, whisk the oil, sugar, eggs, vanilla until blended. Gradually add the flour mixture to the egg mixture, mixing until well blended. Transfer dough to prepared cookie sheet; use damp hands to shape into two 12x2-inch rectangles (about ¾ inch high). Bake 23-25 minutes until golden brown and set at center. Transfer the cookie sheet to a rack to cool for about 15 minutes or until it can be easily handled. Lift the biscotti off sheet onto a cutting board, peeling off the parchment. Using a large, sharp knife, cut it crosswise into slices about ½-inch thick. Discard the parchment. Place biscotti back on sheet with a cut side down. Bake 12-14 minutes until the biscotti golden & dry. Transfer biscotti to a rack and cool completely (they’ll crisp as they cool). I love cooking with all kinds of alternative flours, but have to admit I haven’t tried quinoa flour yet. I am curious and will definitely have to give it a try. 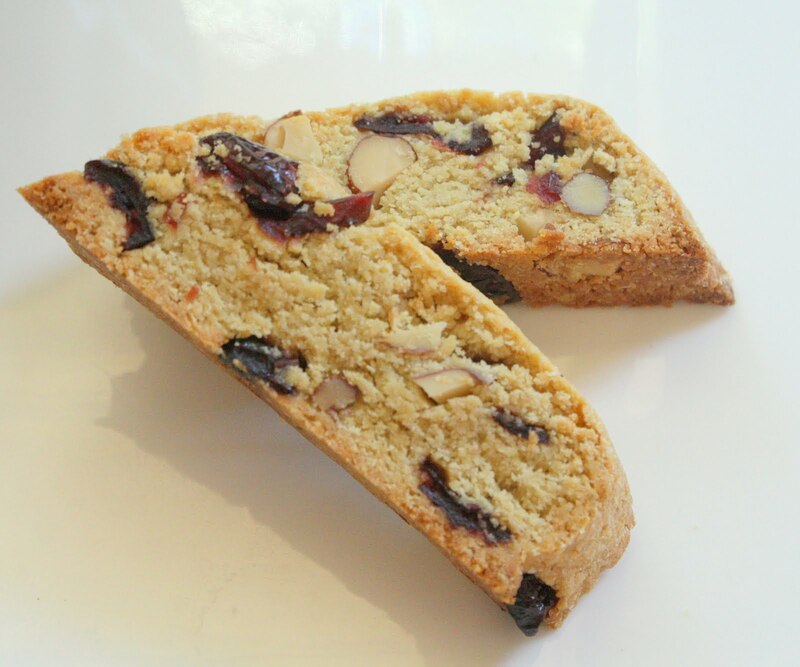 I love quinoa flakes but haven’t used quinoa flour muh – would love to try your biscotti recipe, something my son misses now that he is on a GF diet. Hi Jeanette! I think you will be amazed by the quinoa flour. You don;t have to use xanthan gum for most simple baking (e.g., muffins, simple cakes, cookies, etc). My husband had no idea that these biscotti were anything but my usual biscotti (except that he thought they were especially yummy!) Enjoy! I love Biscotti they’re to die for!!!!!!! And I’m so glad I came through this website coz recently I discovered that I’m intolerant to to certain flour and other foods and among these there are also eggs :S And I was wondering with what I can substitute eggs in this recipe? Any ideas pls? Hi Bee! Chia eggs might be a good choice here! For each large egg, combine 2-1/2 tsp chia seeds with 1/4 cup warm water and let stand 10-15 minutes to thicken. Good luck! Wow!!! Just out of the oven….I don’t think they’ll last untill tomorrow! Do you have a nutritional info?